This project applied Wirth Research’s expert CFD and aerodynamic knowledge to solve wind microclimate issues, and help obtain planning, through to wind loading analysis of Artwork. 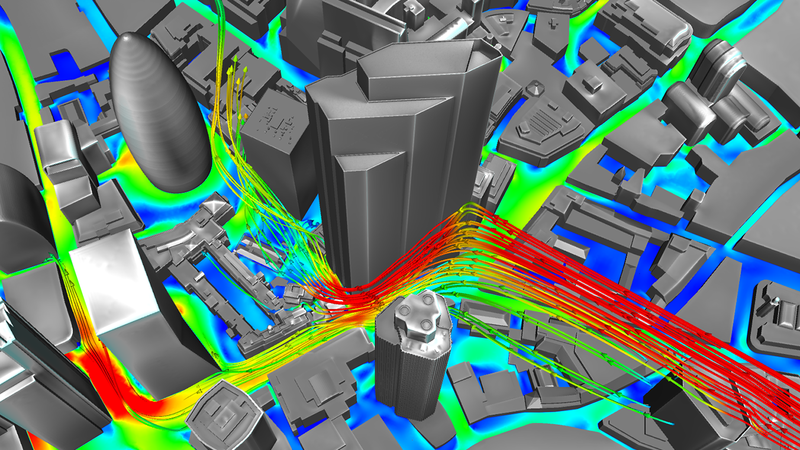 By utilising high resolution CFD, we were able to understand and improve the wind microclimate surrounding the Lipton Rogers’ high-rise Central London building project, 22 Bishopsgate. Our unrivalled CFD capabilities were used to visualise the main causes of pedestrian comfort issues, which had previously not been understood. We were then able to provide solutions that helping the building get planning, along with continued wind engineering services, including wind loading. PLP Architecture A London-based team of architects, designers and thinkers, that continually commits to social, economic and environmental ideals. The team’s specialism lies in the city centre, working on the handling of materials, space and light, where it aims to inspire and enrich society. A real estate development business, which concentrates on large scale city centre projects in London, particularly office developments in the City and West End. It applies a range of creative solutions to solve major challenges, with exceptionally striking results. Its creativity and capability in planning has been the driving force behind many iconic developments in London, including the Tate Modern. 22 Bishopsgate was formerly the site of the Pinnacle. Planning permission was granted in 2006, but construction ceased in 2012. Lipton Rogers rose to the challenge of delivering an eye-catching, feasible and fully funded project, with the aim of providing London with some much needed office space that was both striking and sustainable. Wirth Research was approached as part of the three year long design solution, to provide detailed analysis of the impact of wind around the new high-rise building. Using ‘hi-res’ CFD, Wirth Research was asked to provide the best possible wind mitigation strategies, to maximise pedestrian comfort and safety. Following resolving these issues, Wirth Research continued to provide wind engineering services aiming to maximise pedestrian comfort, along with wind loading analysis of artwork, helping to provide an architecturally pleasing and robust solution. Wirth Research carried out its innovative ‘hi-res’ CFD on the design for 22 Bishopsgate, to ensure wind conditions at the base of the building would be comfortable for pedestrians. A variety of novel wind mitigation measures were proposed to deflect, absorb and dissipate the strong ‘downdraught’ wind created when air hits a tall building. These CFD-derived mitigation measures significantly improved the wind microclimate and in doing so helped the building obtain planning. Since then Wirth Research have worked closely with Lipton Rogers to improve the solution further.